Extraction of natural gas from the Marcellus shale formation is occurring at a rapid pace throughout much of Pennsylvania. As of August 31, 2013 nearly 7,000 new Marcellus wells were drilled in Pennsylvania on approximately 1,900 pads. Each pad averages about 5 acres, with some more than 15 acres in size. Each is associated with new infrastructure, including pipelines, roads, and compressor stations to access the sites and move the gas to market. This rapid transformation of the land is associated with changes in the landscape and associated wildlife habitat. To understand these changes and what they might mean for wildlife, it is important to understand why and how wildlife populations change. “Wildlife 101” will explain some basic principles to help you think about why and how some wildlife populations may change and to make decisions about the best ways to minimize unwanted changes up front. This article will also help you design restoration for the protection and creation of wildlife habitat, whether you are interested in managing for a featured species, such as ruffed grouse, or in maintaining the abundance and diversity of wildlife currently found in Penn’s Woods. In the field guide sections on Restoring and Creating Wildlife Habitat and on Featured Wildlife Species, we discuss specific ways to protect and enhance habitat for a range of wildlife species. Wildlife is a public resource belonging to all of us. This is important to remember, because it is both our right and our responsibility to ensure that our native wildlife and the habitats it depends on are protected during natural gas exploration and development. The Pennsylvania Game Commission is an independent administrative agency of the Commonwealth of Pennsylvania mandated by law to protect, propagate, manage, and preserve Pennsylvania’s wildlife. Their mission is to manage all wild birds and mammals and their habitats for present and future generations. The concept of habitat is one of the most fundamental concepts of wildlife ecology. Habitat is the home address of an animal. It includes the animal’s life requirements such as food, water, shelter and cover, and secure places to raise young. 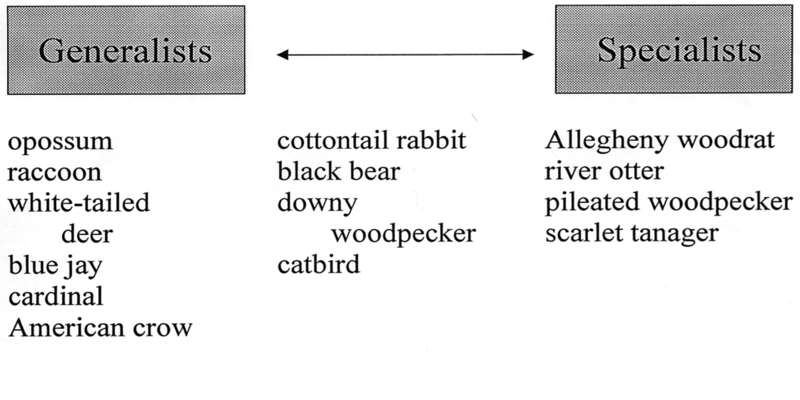 We often talk about broad habitat types such as deciduous forest, farmlands, wetlands, etc. Each provides a unique combination of habitat elements and is associated with a specific wildlife community. For example, deciduous forest provides habitat for turkeys, deer, and a multitude of songbirds. Farmlands provide habitat for cottontail rabbits and species such as meadowlarks that were formerly associated with grassland habitats. Habitat quality is measured with respect to a particular species and is a measure of both survival and reproduction within an area. A high quality habitat is one where an animal tends to have a high survival rate (lives longer) and a high reproductive rate (number of young that are produced and survive is above average). On the other hand, a low quality habitat is one where survival and/or reproduction are low or below average. The animal might be present in the habitat, but its life span is shorter than average and the number of young it produces is less than average. As we think about Marcellus-associated development, we need to think about how it will affect habitat quality for the wildlife community found in the area. We need to look beyond whether we might see a particular species in an area to understanding whether and how its ability to survive and reproduce has changed. Closely related to the concept of habitat is the concept of generalists and specialists. Generalists are species that can be found in a wide range of habitat types. For example, the white-tailed deer is a generalist and can be found in forest habitat, within an agricultural field, or even in a suburban backyard. Conversely, specialists have very narrow habitat requirements. For example, scarlet tanagers are found almost exclusively in mature forest habitat. When we try to predict which species might be most affected by habitat loss, as a general rule, it is the specialists that are the most likely to be negatively affected because if their preferred habitat is degraded, they have no other habitats to use. A generalist does better because it is more adaptable and can often use the new habitat type or others that are available. For many species, habitat requirements vary seasonally, and the types of foods a species eats and the habitats it requires may be very different at different times of the year. If your goal is to provide habitat requirements for a particular species, you need to think about the entire year. For example, habitat use and requirements vary seasonally for ruffed grouse. In spring, male grouse attract females by displaying from drumming logs—large downed logs with lots of overhead cover—within forest habitat. Later in spring, females with young forage on high-protein insects found in small herbaceous openings or at the grassy edges of small forest roads. In summer, grouse are found in young forest where there is an abundance of both hard (nuts) and soft (berries) mast. In winter, grouse seek areas with conifers that provide thermal cover. Grouse are resident species, meaning that they do not migrate in winter, so reach their highest abundance in areas where all of their seasonal habitat requirements are met. When managing for a particular species, we need to identify what their habitat requirements are during different seasons and life stages. As Marcellus exploration and development changes the landscape, we need to ensure that we both protect important habitat elements that are currently present from being degraded and use potential opportunities to create or enhance new habitat elements during the restoration stage. The group of individuals of a particular species in an area makes up the population of that species. Populations change in abundance as a result of a change in survival or reproduction or a change in the number of animals moving into or out of an area. When we think about how Marcellus development is changing the landscape, we need to think about whether it is likely to affect the survival and reproductive rates of a species or the probability of animals moving into or out of an area. Will animals be likely to live for a longer or shorter time? Will Marcellus development affect the number of young that are produced and survive to breeding age? Will Marcellus development affect whether animals move into or out of an area? For example, in the West, mule deer tend to move out of and avoid areas where extensive natural gas development has occurred. In eastern forests, some species of wildlife, such as white-tailed deer, may move into areas with pipelines that have been restored to herbaceous cover. New roads with high truck traffic will likely reduce survival rates for many types of wildlife. A limiting factor is the one factor that is currently limiting the growth of the population. You can think of it as a bottleneck. At any one place and time, there will be one limiting factor. It could be the amount of food or water, competition from another species in the same area, or predation levels. A positive change in the limiting factor will result in an increase in the local abundance of that species. A negative change will cause a decline. 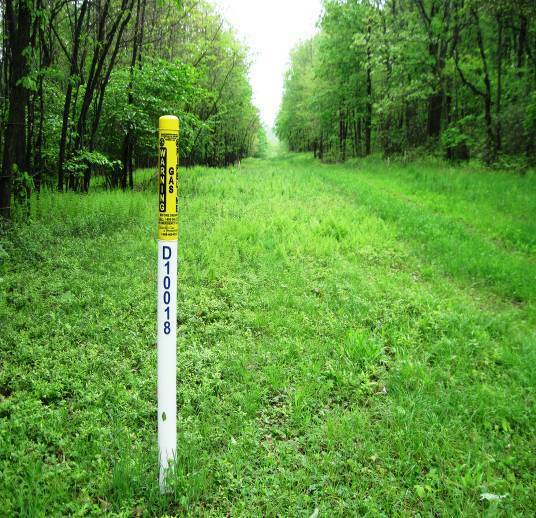 How will Marcellus exploration and development change limiting factors? For some species, it may provide new habitat that was formerly limiting the growth of the species. For example, in Pennsylvania forests, the abundance and availability of early successional (young) forest limits the abundance of some species. Depending on how pads and pipelines are developed and restored, they may provide local increases in early successional habitats. For other species, an important habitat component may be removed, degraded, or changed during development so that it now limits the local abundance of that species. 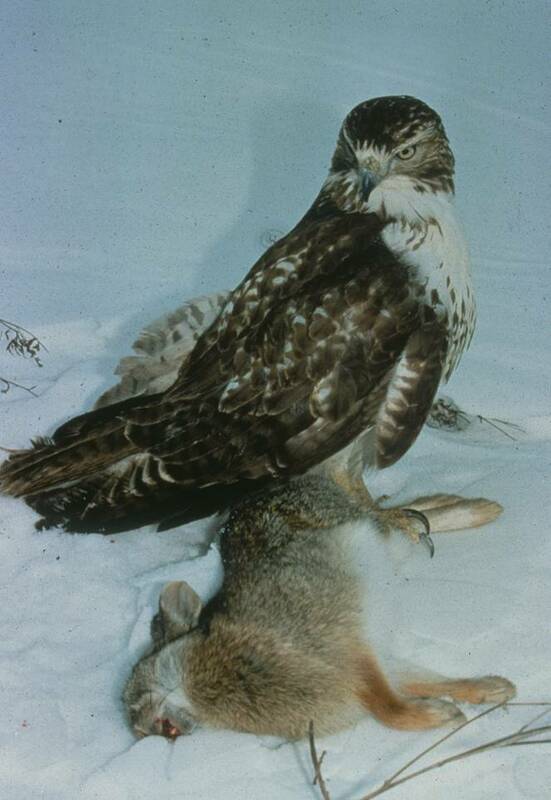 An ecological trap occurs when an animal is attracted to an area that appears to have the components of a high quality habitat but in reality is an area where either survival or reproductive success is low. Hay fields are an excellent example of an ecological trap for a grassland bird called the bobolink, which is attracted to the cover hay fields provide. Bobolinks often nest within hayfields but rarely are reproductively successful there because their nests are destroyed when the fields are mowed and the hay is cut. Over time, one would expect this behavior to be eliminated by natural selection. However, most ecological traps are human-related and relatively new (in the big scheme of things), so most populations have not had time to adapt. Will Marcellus exploration and development result in new ecological traps? For example, pipelines planted in herbaceous cover may attract birds such as wild turkey to nest there, but if pipelines also attract nest predators, they may function as ecological traps. As we consider how to restore and manage habitats, we need to consider how to avoid the creation of ecological traps. Wildlife species exist within larger communities of organisms that influence and are influenced by each other. As we change the populations of one species, we can have far-reaching effects on multiple other species. As Marcellus shale exploration and development occurs, we need to look not only at the species that are immediately affected but also at the far-reaching effects that these changes may have on other members of a community. Sometimes these changes can be difficult to predict. For example, a change in the abundance of a predator can directly influence the abundance of its prey, which then may affect other organisms that it feeds on, thus creating cascades of changes.